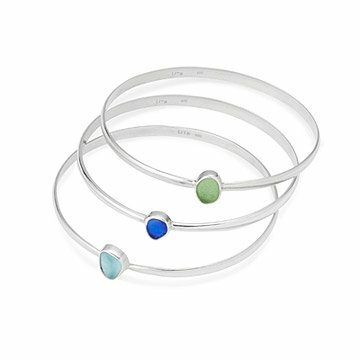 These silver and sea glass bangles can be worn individually, or stacked for a lovely, layered look. Handcrafted from unique pieces of sea glass set in pure sterling silver, these bright bangles can be worn as individual accents, or stacked together for a lovely layered look. Each piece of beach-gathered sea glass is a uniquely tumbled treasure, making each bangle truly one-of-a-kind. Handmade by Carla Garro in Massachusetts. Growing up in coastal Massachusetts jewelry designer Carla Garro spent her summers at the beach collecting treasures up and down the shore. Jewelry has always been her passion and she is an entrepreneur at heart. Opening her first business at the early age of 18 Carla's creative wheels have been turning ever since! She owned a womens gift boutique for several years, which is where Lita Sea Glass Jewelry first took shape. The sea glass jewelry took off rapidly and eventually Carla decided to focus full time on her growing sea glass jewelry line. Since then Carla has had the honor of being featured at the Golden Globe awards along with several magazine features including Coastal Living Magazine. Living her dream and pursuing a career that she feels so passionately about Carla feels thankful for all the steps that have led her down this seaside journey! Read a Q&A with Carla on our blog. You can use a silver jewelry cloth to polish the silver around the sea glass. To restore luster to the surface of your sea glass you can rub a small amount of baby oil on the surface of the glass. My bracelets just arrived and am so pleased with them! I intend to wear them everyday, I'm hoping they will hold up for continuous use. i bought these along with the matching necklace. first i thought the bracelets were sold as a "set" of 3 as that's how they appeared on the web site. then i discovered the price displayed was for one bracelet. unfamiliar with the way ladies' products are sold i chalked that up to my inexperience. when they arrived i was disappointed in how small they were. but again, i did not read the description carefully enough to have known what the physical size was. i think my recipient really liked the pieces and that's what really matters most, i guess. i hope she'll enjoy them for a long time. i love seeing her smile.